Please note: This app is rated 12+ for frequent/intense realistic violence. It is intended for older kids. Please keep this in mind before purchasing. Timeline World War 2 is a fascinating history app. It uses a timeline format to present events, pictures, and videos related to World War 2 in brilliant clarity. With 2000 events & facts, more than 100 videos, and an eight-part documentary, I would highly recommend it for students or adults with an interest in learning about this era. Timeline World War 2 is one of those apps that makes leaning an absolute joy. It would be easy to get lost in this app for hours at a time. Upon opening the app, an introduction video begins in which broadcaster Robert MacNeil explains the features of the app. The timeline includes thousands of facts arranged in order from 1939 – 1945. The user can decide how much detail they want to see – simple facts, or more in-depth information. There are also pictures attached to many of the events, which the user can zoom in on to get a closer look. Historical videos are included as supplementary information, and the user can choose to either listen to the original video narration or hear Robert MacNeil discuss the video and give a different point of view. On top of the timeline, the user can also pull up a world map. The map gives factual information & shows shifting borders while highlighting the areas around the world that are being discussed, and are color coded to convey who was occupying each area. This is an excellent tool for allowing users to see the global impact of the war, especially as many kids today struggle with world geography and have a hard time visualizing where events actually occurred. Other excellent features include an event filter, a search function, and This Day In History. This app is absolutely stunning. The timeline itself is beautifully arranged. The sheer volume of information is overwhelming, but in a good way. The maps, pictures, and videos appeal to visual learners, and the narration by Robert MacNeil adds an extra learning element to the videos. The app functions flawlessly and is easy and intuitive to use. I cannot say enough good things about this app. It is more costly than most of the apps in my collection, but it is worth the price – parents and teachers will not be disappointed in the content and function of this app. Timeline World War 2 is a definitive history of the Second World War, presented by broadcaster Robert MacNeil. – Eight part documentary on the War in the Pacific. 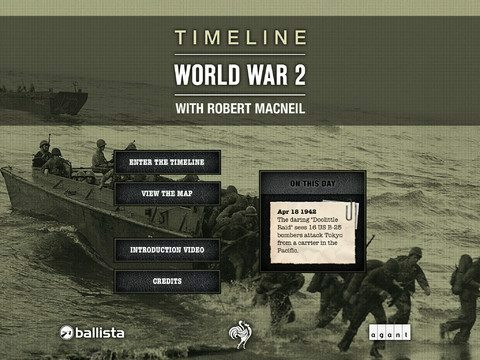 History Buffs Will Love Timeline World War 2 with Robert MacNeil…..This is a fantastic learning aid, and well worth the price for students…..This is the perfect app for anyone who is interested in military history. It’s a beautifully-designed demonstration of the iPad’s powers as a publishing platform for nonfiction…..This reader, for one, found it a vivid and immersive exploration of a defining event in modern history. Note: The video content requires an internet connection to view.